I READ on your website today that the world's most famous Holocaust survivor, Elie Wiesel, has this to say about the world's most famous Holocaust denier, President Ahmadinejad of Iran: "When he says he wants nuclear weapons to destroy Israel, I must believe him." Has President Ahmadinejad ever said he wanted nuclear weapons? No , he has not; he has actually said he does NOT want them! Has Ahmadinejad ever said he wanted to destroy Israel? No, he has not! Even MEMRI, the well-known Israeli propaganda website, has never claimed that Ahmadinejad had expressed a desire to "wipe Israel off the map". It is now commonly known, except by the ill-informed, that this was a mischievous misquotation based on a deliberate mistranslation. Wiesel's reputation for veracity has been called into question more than once. His famous memoir 'Night' claims to be an account of his youth in Auschwitz and other Nazi death camps. Confronted with evidence that his memoirs were a work of fiction, Wiesel had this to say: "Some events do take place but are not true; others are, although they never occurred." Which is another way of saying: when I lie, I am telling the truth! It is more than likely that Wiesel's Holocaust reminiscences have no more substance to them than those of Swiss hoaxer Binjamin Wilkomirski, who in 1994, to much acclaim, published a book called 'Fragments' which in many ways bears a striking similarity to Wiesel's 'Night'. This turned out to be a tissue of fabrications, though it is still used in Israel and in Jewish schools in the United States to pull the wool over the eyes of the faithful -- a hoax still passed off as genuine. 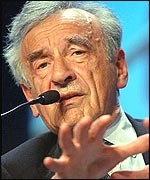 Christopher Hitchens once asked: "Is there a more contemptible poseur and windbag than Elie Wiesel?" (The Nation, February 11, 2001). He was unable to find one. Possibly because there is only one thing more contemptible than an outright Holocaust denier -- assuming that any such person exists -- and that is a Holocaust fabricator. BBC: Why are Jews at the 'Holocaust denial' conference?